Gregg Berhalter brings his tight philosophy from the Columbus Crew to the USMNT. Just one big problem: America doesn’t have a Federico Higuaín. 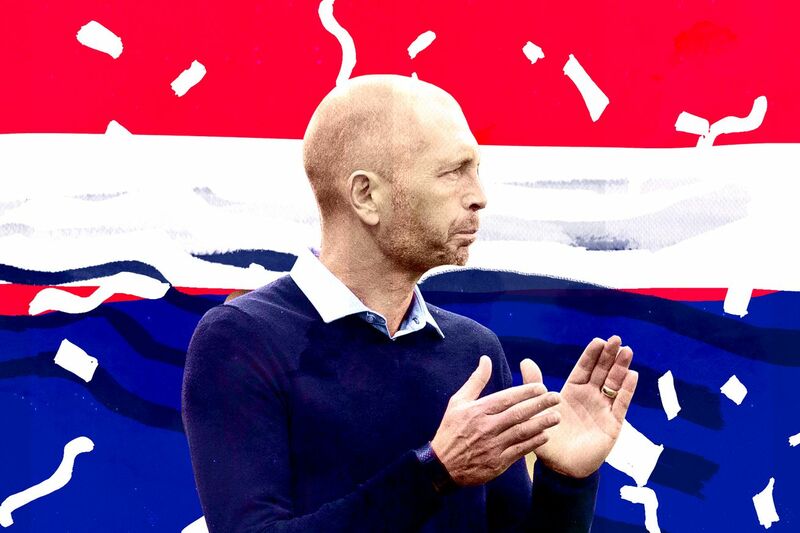 By the time the MLS playoffs rolled around in November, Gregg Berhalter had already been declared the next United States men’s national team head coach by the American soccer rumor mill. Fans tuned into the Columbus Crew’s playoff games to get a glimpse of how the USMNT might play in the future. And while we got to see what made Berhalter’s Crew a great MLS team, we also saw what he’ll be missing in his new job: Federico Higuaín. Higuaín was Columbus’ hero in the knockout stage, scoring two goals against D.C. United. He sat the first half against the New York Red Bulls four days later, and when he came off the bench, he created this goal. What American man can do that with any regularity? There was a lot to like about Berhalter’s Crew. They kept the ball very well, often building slowly from the back, but also consistently looked for opportunities to play direct passes that beat defenders. They used the entire pitch, with wide players and central midfielders who were all equally capable of creating scoring chances. They had a good defensive shape and a well-defined pressing strategy. If Berhalter is a good coach, he can instill those principles into the USMNT. But those principles worked as well as they did because of the talents of Higuaín — a sensational playmaking central attacking midfielder, commonly referred to as a No. 10. So how is Berhalter supposed to build a better, more attractive USMNT without a player like him? There are no obvious solutions to this problem, but plenty of potentially good ones. Berhalter, 45, is an adaptable coach. He played a much more conservative style as manager of Hammarby in Sweden, and had no problem setting up his Crew team to play direct when opponents gave them space to do so. But if U.S. Soccer wanted a coach to grind out results with his players’ excellent fitness and athleticism, they would have hired someone else. It’s also clear from its recent hires that U.S. Soccer would like to move in a different direction. New chief sport development director Nico Romeijn, formerly of the Dutch FA, was one of the key figures in hiring Dutch-American general manager Earnie Stewart. He went on to hire Berhalter, who says he got most of his ideas about how the game should be played from the Netherlands. The USMNT wants to play stylishly like the Dutch do, with the ball on the ground. “We want to use the ball to disorganize the opponent to create goal-scoring opportunities,” Berhalter told me in October. The Crew succeeded at that by building their attack around Higuaín. One problem: there’s never been an Higuaín in the U.S. player pool. Creative forward Joe Max-Moore filled the central attacking midfield role well when needed in the 1990s, as did smooth passing central midfielder Tab Ramos around the same time, then Claudio Reyna into the 2000s. The following generation fielded some other very good players in that role — second strikers Clint Dempsey and Landon Donovan, most notably — but none of them was ever a true playmaking central attacking midfielder. Most recently, that responsibility has fallen on a couple of young players — Christian Pulisic, who only plays wide for his club team, and Julian Green, who has been an effective defensive No. 10, but not much of a playmaker. There are a few promising attacking midfielders in the youth ranks, but none plays regular top division soccer at the moment. What makes Higuaín so important to the Crew’s style? To understand the problem that Berhalter is solving for, we need to talk about exactly what Higuaín meant to his system in Columbus. This is Higuaín’s first highlight of the season, 11 minutes into the season opener. One day, an American man will show this kind of technique and movement with regularity (three sobbing emojis). Higuaín can also create a ton of space for his teammates with nothing more than his dangerous reputation. Teams are often so scared of letting him get any time on the ball that they’ll chase him anywhere on the pitch. It’s not uncommon to see a midfielder close down aggressively on Higuaín, opening up huge space for one of his teammates to attack. If you keep your eyes trained on Higuaín during a Crew match, it’s clear that he’s a vocal and demonstrative leader. Higuaín looks like a traffic cop, but one who commands the respect of a general. He will clap and give thumbs up in response to passes that weren’t intended for him, or point where he wants a pass to go or a teammate to run. And other players follow his lead on when to press aggressively or fall back into shape. Berhalter can’t manufacture that. There’s no tactical solution for not having any players with Higuaín’s reputation or experience. What Berhalter probably can solve for, though, is Higuaín’s final third contributions. Defenders will close down on any junk player who is central and 25 yards from goal, so if Berhalter can get the ball into that area, he can draw defenders out of position. Goals and assists won’t be that hard to replace either — this is where Christian Pulisic is 1,000 times better than anyone who’s ever played for the Crew. What other stuff does the Crew do that might work for the USMNT? Here’s the long version of the goal from the beginning of this story. Watch all of the dope stuff that the non-Higuaín people do! There are some hard passes here, yes. Central midfielder Artur and left back Milton Valenzuela are probably a bit better at long passes than any of their American counterparts. But this build-up is mostly about good coaching. The Crew’s players know how they want to move the ball from back to front, and everyone makes good individual decisions about where to move and who to pass to. The structure and decision-making in this move are much more important than anyone’s talent, right up until the ball reaches Higuaín. There are even a couple of sloppy touches that the Crew don’t get punished for because they’re making all the right choices. Berhalter’s commitment to playing out of the back has led defenders who were once pretty average with their feet to get really good. This very nice and somewhat terrifying exchange is typical of the Crew. The U.S. men’s national team does not have silky-skilled center backs, but neither do the Crew, really. Watching American defenders try to play like this might scare even the most ardent of Pep Guardiola stans into screaming “HOOF IT,” but your anxiety will soon pass. Berhalter is, if nothing else, good at coaching the spacing and decision making necessary for playing the ball out of the back. Once they get the ball forward, the Crew are really good at moving the ball inside and out to draw defenders out of position and create tap-ins for their center forward. This is a bit tougher to accomplish without a central attacking midfielder who picks perfect passes out wide, but the USMNT also has better wide options than the Crew. The most common source of USMNT goals during the Berhalter era is likely to be Pulisic runs to the byline, and cutbacks for a Josh Sargent (or Gyasi Zardes) finish from six yards. Does all that sound exciting? WELL, HOW’S THIS FOR EXCITEMENT? 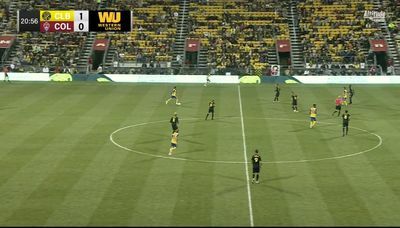 This — a line of two black-shirted forwards ahead of four black-shirted midfielders, waiting for the opponent to cross midfield rather than pressuring the ball — is the defining image of the 2018 Columbus Crew. Sure, they had 57 percent possession — good for second in MLS — but the other 43 percent of the time, they looked like this. If you watched more than one Crew match, this image is burned into your brain. The Crew were better at building up slowly through the middle than counter-attacking quickly, and they didn’t have great athletes to press high up the pitch, so they sat in this shape a lot and waited for opponents to cross midfield before aggressing. Boring, right? Well, the USMNT has better athletes and worse deep passing than the Crew, so it appears that Berhalter’s USMNT is going to do something a little different. Hell yeah. Pressing after losing possession might be a huge part of the solution to the Higuaín problem. How is Berhalter’s USMNT going to play? 1. The USMNT has fewer players suited for build-up from the back than the Crew, so it should be more effective for them to start most attacks from higher up the pitch. 2. The USMNT has better athletes and fitter players than the Crew, so they can actually win the ball if they press aggressively, while the Crew probably would have wound up chasing shadows. The player pictured in the screenshot above, Kellyn Acosta, is among those perfect for applying pressure. 3. If you can force mistakes and win the ball high up the pitch, with the defense scrambling and very few players behind the ball, you don’t need a superstar No. 10 to control the game or create chances. So, Berhalter will likely want to win the ball up high on the pitch while maintaining most of the other principles from his Crew teams, mitigating the absence of a No. 10 who is dominant for that level. He’s got a few ways he could set up his team to accomplish those things. Formations do not equal tactics, of course. There’s so much more to a coach’s philosophy than the initial shape displayed on the lineup card. But the formation that Berhalter uses is going to tell us a lot about what he wants to accomplish, and what he thinks his personnel is capable of. Pros: Christian Pulisic is far and away the USMNT’s best player, and this gets him the most opportunities to get on the ball and make plays. Josh Sargent has shown the ability to play as an isolated lone striker, but getting an attacking midfielder close to him might benefit him a lot early in his career (he’s only 18 years old). Berhalter’s teams have always played some variation of this shape, so these players will certainly be well-drilled. Cons: It demands a lot of discipline from Tyler Adams and Weston McKennie when the team might be better served by making their youthful legs run a lot. There’s little playmaking ability in this setup, and it’s tough to see how the ball is ever going to get to Pulisic in a dangerous area if the team doesn’t create turnovers. Pros: This requires less discipline and allows Adams and McKennie (or whomever plays those more advanced central midfield roles) to mess people up more often. If Berhalter wants to win the ball up the pitch, this formation should let them pressure aggressively with five players while the other five hold shape. Pulisic might not get on the ball as often, but he’ll be playing the role he’s used to at the club level. Playing someone like Wil Trapp in a true No. 6 defensive midfield role instead of using the double pivot from Berhalter’s preferred formation could make the play-out-of-the-back learning curve a bit more gradual, too. Cons: The USMNT won’t be able to create much if they aren’t winning the ball high up the pitch, since there’s not much in the way of midfield playmaking without anyone in the No. 10 role and runners in central midfield. Failure to win the ball high could also lead to Sargent getting isolated. When Trapp has played this role for interim manager Dave Sarachan, rather than as part of a double pivot like in Option 1, he has struggled. Pros: Outside of Pulisic, winger might be the shallowest area of the USMNT player pool. The team has plenty of good defenders, midfielders, and strikers. Why not find a way to get all the good players onto the pitch in roles they like? This setup allows the USMNT to spread some of the Higuaín duties around to a second striker and an attacking midfielder, rather than relying on one guy to fill the role or abandoning it altogether. The American fullbacks are all much better going forward than they are defensively, too, making them good fits for attacking roles in a back three setup. Cons: Unless your outside center backs, advanced central midfielders, and strikers are well-drilled and have great chemistry, you won’t be taking advantage of wide areas that much. Creating a square ball or cutback from a winger to a striker is the primary means of chance creation in Berhalter’s system, so it seems unlikely he’d turn to this. He’d have to be really confident in his ability to coach a system that’s radically different than his previous one. Pros: Listen, this is America. Enough with the fancy crap. We have some hard working dudes who know how to play a classic two-striker system. If you don’t have playmakers, getting two strikers on who can play off each other is a really good idea. There’s a reason that Bob Bradley and Jürgen Klinsmann both defaulted to this when they were otherwise stumped. These players are good at it and know how to play it. Cons: Berhalter wants to control the possession battle and build up from the back through midfield — two things that are really difficult to do in a 4-4-2. It’s not impossible, not by any stretch, but you need elite players and even more elite chemistry. Unless your midfielders and second striker are all-world, you can’t control a game like this. It might seem like Berhalter has a lot of time, with the World Cup not coming until 2022, but he’ll have just four friendlies with all players available for selection before the 2019 Gold Cup this summer, and World Cup qualification isn’t far away after that. The addition of the CONCACAF Nations League to the calendar should be a welcome change for Berhalter, who will get three more competitive games between Gold Cup and the start of World Cup qualifying than any of his predecessors did. Matches against Panama on January 27 and Costa Rica on February 2 will give us some idea of what Berhalter is thinking, but we won’t be able to draw any serious conclusions about the future of the USMNT until he gets his hands on his European-based players for friendlies against Ecuador and Chile in March. His third game with a full squad will be against Mexico and the man a lot of American fans wanted to take over the USMNT, former Atlanta United manager Gerardo Martino. It will be played in Arlington, Texas, on June 11 in front of a heavily El Tri-leaning crowd of 75,000. The game will be called a friendly, but let’s be real, it won’t feel anything like a friendly. The realistic best-case scenario is that Berhalter hits the ground running and gets his team playing the way he wants very quickly. They go on to win the Gold Cup and qualify for the World Cup comfortably. He’s more qualified than Bruce Arena and Bob Bradley were when they took the job, and his attention to tactical detail utterly dwarfs Jürgen Klinsmann’s. It wouldn’t be the least bit shocking if he’s an instant, roaring success. It’s also pretty easy to envision a world where Berhalter’s ideals don’t fit the USMNT, and the Americans struggle to qualify out of CONCACAF like they did in 2017. He’s taking over a team at the height of a lost generation problem, and he’s faced with the task of turning teenagers into the focal points of a senior national team very quickly. There are plenty of good coaches who would fail in the same situation. But that’s all a long way off. Step one for Berhalter: Solve the Higuaín problem, and from there, the rest might fall into place.